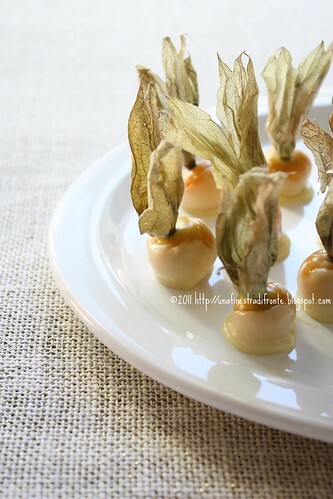 Serves: 30 Difficulty fruit ': Easy Preparation time: 40 minutes INGREDIENTS 300g 30 Physalis. White chocolate 200gr. dark chocolate 2 tablespoons heavy cream 2 tablespoons water Stir PROCEEDINGS -------------------------- backwards along the stem, wrap fruit, forming a tuft. Meanwhile, the two divided grated chocolate. Put in a casserole white chocolate mixed with cream and another dark chocolate mixed with water. Put the two pans in a large bowl of hot water over low heat. Stir in turn until the two types of chocolate 'does not have dissolved completely. Take each fruit by holding the bunch and one by a dip in white chocolate. Place it on a sheet of aluminum foil stretched on a plate. When they are completely dry outside, repeat dipping pero 'for target' in a bath of dark chocolate, so they are coated with dark chocolate at the bottom and white chocolate in the top one. Let dry again on a sheet of aluminum foil and when the chocolate will be 'very solid, gently arrange them into as many cups of cake.